I-M Wrist Brace(WH-301) is a wrist brace that provides optimal protection and support to an injured wrist. Its elasticized design keeps a firm grip on the injured area, expediting the recovery.Supplied with an aluminum strip, the I-M Wrist Brace(WH-301) keeps the injured wrist firmly in place. This helps the wrist recover faster from muscle tear and fractures. 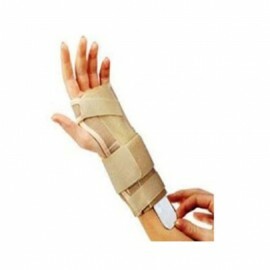 The product ensures that the wrist is perfectly angled and receives unhampered blood circulation. This product is made of breathable materials to immobilize and provide firm support with comfort to wrist & forearm, reduce pain and swelling. It is easy to put on and minimize skin irritation.